From Apple to Fitbit, our Milanese replacement bands have gained wide identification and highly attention on Amazon for several years. Nowadays, people are attaching more and more importance to their health and fitness level. The more brave ones even challenge themselves in extreme activities and adventures. Considering the merits of Milanese material, we decided to apply it to Garmin Vivofit watches which are well-konwn as forerunners of outdoor equipments for their accurate navigation system. We are always on the way of innovation. ☑️DUAL PROTECTION DESIGN: silicone pad on the top cover to fully protect front screen,and the bottom cover designed with shockproof foam prevent your vivofit &vivofit 2 from scratching. 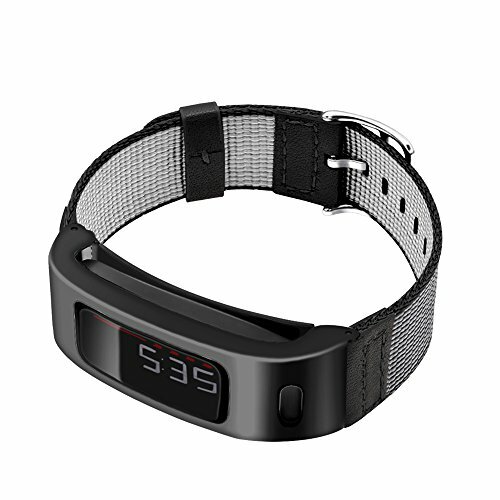 ☑️TOP-GRADE METAL CASE BAND DESIGN: 0.01in-thickness 316L stainless steel case be used, lightweight but heavy-duty, waterproof nylon mesh lets sweat out &air in. ☑️OUTDOOR&SPORTS USAGE SCENARIOS: 10+ thousand nylon mesh with breathable feeling on your wrist,anti-slip & sweat-absorbent,flexible and adjustable, suitable for most sports. ☑️WARRANTY & SERVICE: 1-year warranty basically if any issues related with your purchase, scan the warranty card to get one year more guarantee; Timely-reply within 24 hours, please feel free to contact us.